Towards the end of my recent short break in Hamphire I found myself very near Droxford in the picturesque Meon Valley. Having just enjoyed a nice pint of Bowman’s Swift One with a late lunch at the Hampshire Bowman I remembered that the Bowman Brewery was in the area and decided to get some takeaway to enjoy with friends that evening. 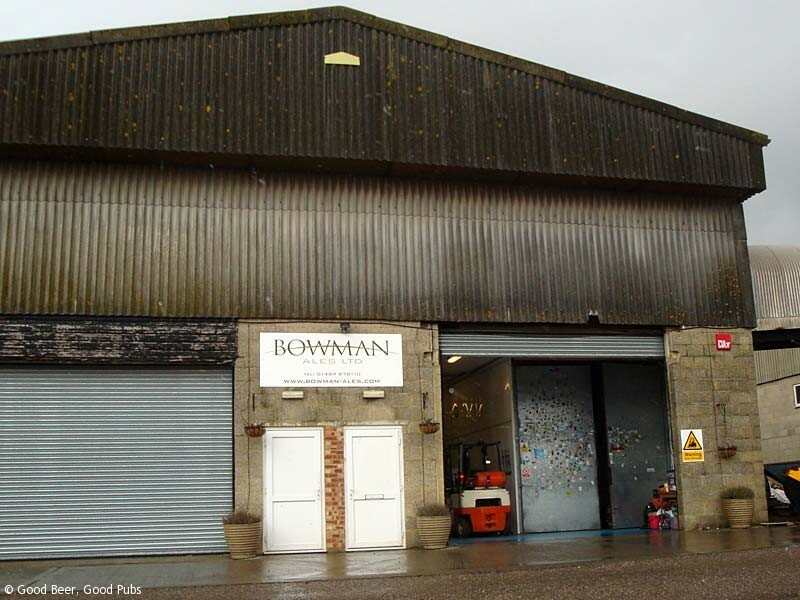 The Bowman Brewery is located at Wallops Wood Farm, just off the B2150 which runs east from Droxford. Once you are at the farm buildings, the brewery is hidden away in the industrial units at the back. After seeing the extensive shop at the Hogs Back Brewery in Tongham, Surrey I didn’t know what to expect. Well, Bowman’s have no shop as such but the office is just on the left through the main doors and they are more than happy to sell you some real ale. Takeaway is available in three sizes – 9 pints, 18 pints and 36 pints, and the beer is sold in minipins that resemble wine boxes. The real ale is sold ‘bright’ which means that it’s dispensed from a cask in the brewery into the box – it should last for a couple of days apparently. 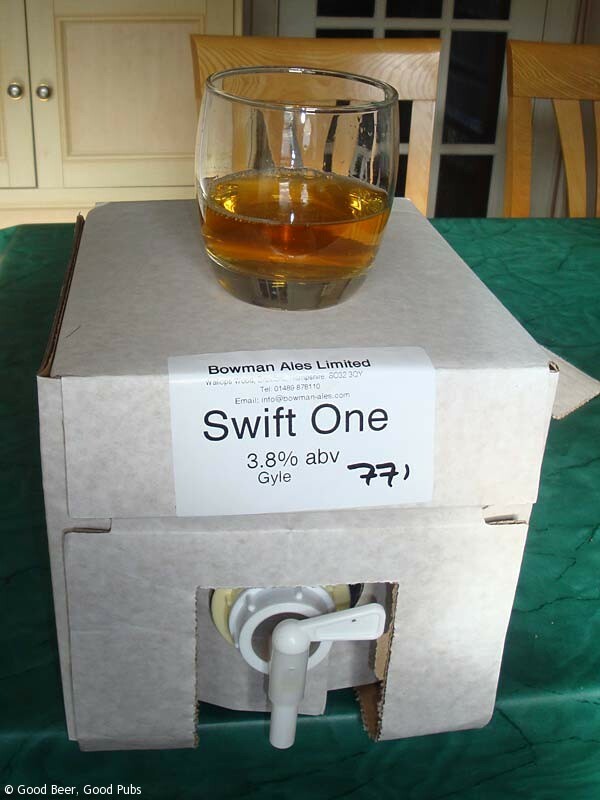 The prices are very reasonable – I paid £16.50 for a 9 pint box of Swift One. That’s less than £2 per pint! Current prices can be found on the Bowman Brewery website, and they do suggest you phone ahead if you want a specific beer from their range. As you’ll see from the photograph, apart from the label the box is completely untroubled by any branding. The vibration of the drive home obviously shook the beer up slightly as the box was definitely domed when I got home. 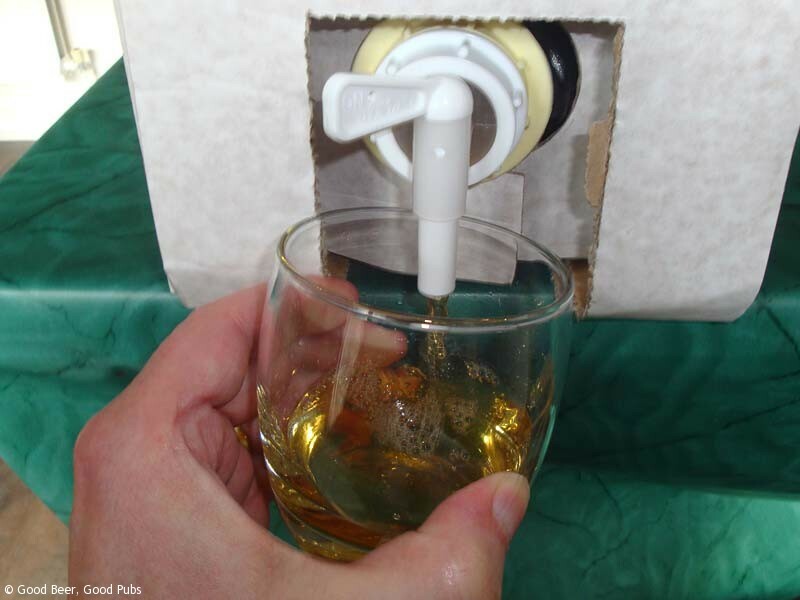 If this happens to you, serve the first pint with care as it’ll come out like a rocket. I know what Swift One is like so when I tasted the first drop I was not at all surprised to find that it tasted delicious. Swift One is a light straw coloured session beer and at 3.8% shouldn’t cause you too many problems. It does look a bit odd when you turn up for a social gathering with a box of beer under your arm instead of bottles or cans, but it proved to be a popular choice and not surprisingly it all went.